There’s still plenty of time to make your nearest and dearest some tasty Christmas presents. At the very least, you should make a batch of spiced nuts – they’re good to take round to parties or anywhere else nibbles are required, and if they don’t make it out of the house (and they are quite hard to part with) you can eat them to sustain you while you wrap presents. It goes without saying that they go well with the drinks you will probably be drinking at this time of year. Also, they are easy-peasy. For some reason I spend a fortune on similar flavoured, spiced, coated etc. nut products all year round and only actually make my own at Christmas. Just writing that I’m baffled at myself. Because basically, all you do is spread your choice of plain, unsalted, unroasted nuts on a baking tray, mix them with whatever herbs and spices take your fancy, drizzle over a little oil and salt and toast in the oven until golden and delicious. That’s all there is to it. However, I do have a couple of variations that I particularly like and can heartily recommend. They taste far better than anything you can buy in a supermarket aisle. The first is an Ottolenghi recipe cut out of an old Christmas food edition of the Guardian (along with a particularly great slaw with maple, pecans and cranberries which I have also made often since). I think this might have been the recipe that opened my eyes to the nigella seed. They work so well in this, and that’s before you even get to the honey with the salt, the heat of cayenne pepper with the earthiness of rosemary – completely addictive. The second is from Allegra McEvedy’s brilliant Colour Cookbook and comes in the form of a za’atar coated almond. There’s a bit of egg white in it for a stiffer crust and again it’s a combination that works in opposites – the sumac is bright, the thyme is a base note. You should make more za’atar than you need as it’s so good on flatbreads (or what about breadsticks – the party nibble ideas just keep on coming!) and takes seconds to make. And even if you can’t be bothered you can buy it in Waitrose now. 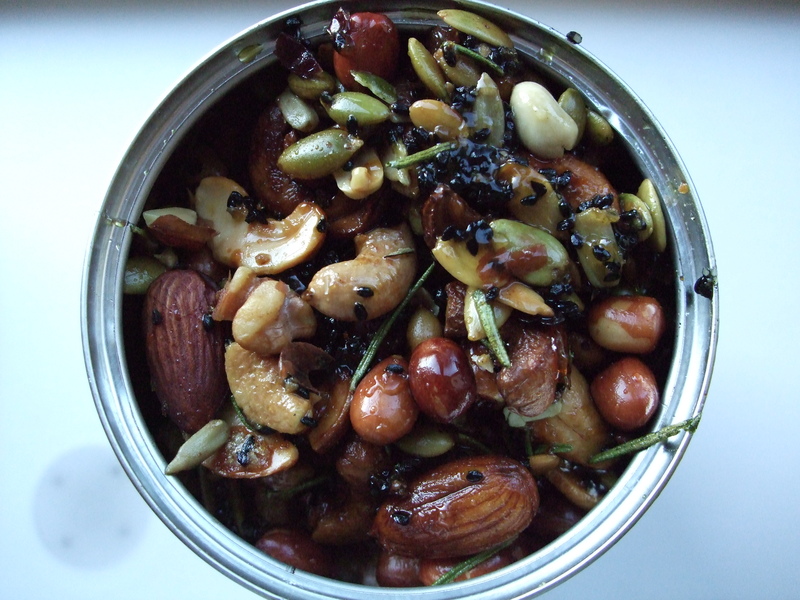 I’m giving the original quantities/varieties of nuts from Ottolenghi’s recipe, which I like, but you can obviously substitute for any other nuts you prefer. Preheat the oven to 170c. Mix all the ingredients except for the black pepper and cayenne in a big roasting tray and roast for 15-17 minutes, until dark brown. Stir once or twice during the cooking time. Stir in the cayenne and pepper when the nuts come out of the oven and add more salt if needed. Store when cool in an air-tight container. Make the za’atar by grinding the ingredients together in either a pestle and mortar or a coffee/spice grinder (double or triple the quantities if you want za’atar left over). Whisk the egg white until frothy, whisk in the za’atar and stir into the almonds until well coated. Tip onto a greased baking tray and spread out evenly. Roast for 15-20 minutes, until dark brown. Serve warm or cool in the tray and store in an air-tight container (you might need to break them up a bit).